I can't seem to find an early reference to the Loaded Sacks in the Meccano Magazine, but the train couplings (part 121) are in the list of "New Meccano Parts" in the March 1920 issue and the triple pulley (part 123) is introduced in the November 1920 issue, so it is reasonably safe to assume that it came at some point in this year. Twelve of these were included with the new Outfit 7 in 1922, but were dropped when the outfit was reorganised in 1930. These outfit 7's (and the corresponding outfit 6a's) remain the only outfits to include Loaded Sacks, although they were available until 1940 according to the Meccano Magazine. In the October 1953 issue, Meccano announced the reintroduction of several pre-war spare parts, including the Loaded Sack. Although smaller than the pre-war version, this was a very similar (and similarly useless) part. It was available only as a spare part. The Loaded Sack was removed from the spare parts lists in 1978, although it is not certain whether it was commonly available right up to that date. It is almost impossible to tell the date of spare parts, and since these were only supplied in the largest outfit 7 it's tricky to be sure whether the parts are original to the set. Thus, we can only guess at the dates for each version of this part. 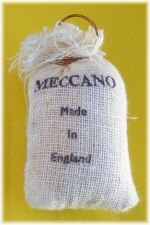 Pre-war parts are certainly larger, and I believe the earliest loaded sacks have the Meccano logo printed diagonally across the bag. This printing is almost always top-left to bottom-right, but very occasionally is found from bottom-left to top-right. The bag is sealed with a twist of fine steel wire and a loop (for a crane hook to pick the sack up). 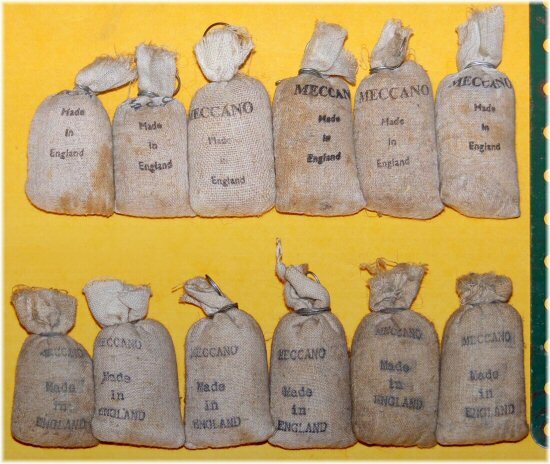 These Loaded Sacks are large and lightweight – around 12g each. Other early sacks are found considerably narrower, such that the final shape is more of a tube than a rectangle (see top middle example in the photo above). The printing on these is more often bottom left to top right, and is in a black print that appears to fade to purple or even disappear completely on many examples. Although EMP describes loaded sacks without printing, all examples I've seen to date appear to be of this second type with the very faintest hint of the letters still showing. At some point the printing changes to be in red, and the letters are vertically up the centre of the sack (second one from the left in the picture above). These sacks are also considerably heavier, around 32g give or take a few grams. 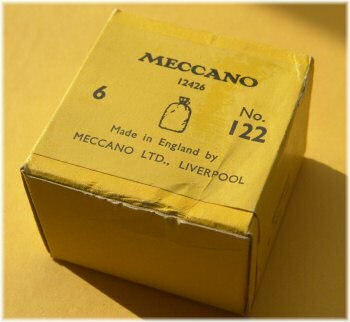 The lower left example shown above is less common, being the larger size but with the words Meccano Made in England printed horizontally across the bag, in a typewriter font. Note that England is in capitals on this version. The wire loop at the top is of a much thicker gauge. It's probably that these are the earliest of the post-war versions, and they match the picture of their reintroduction in the Meccano Magazine of 1953. 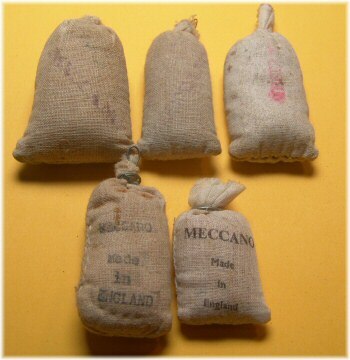 By far the most common type of loaded sack is shown to the bottom right of the picture above, with a much smaller sack (around 1½'' high as opposed to over 2"), and the horizontal printed logo. "Made In England" is in mixed case sans-serif throughout, and smaller than the Meccano logo which is in a serif font. 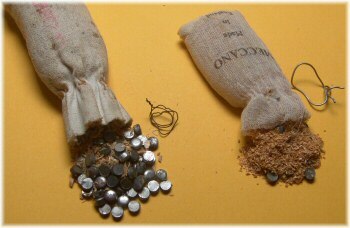 These sacks are about the same weight as the original, around 12g or slightly less. If you can't help yourself opening a sack, you will find that the contents of the sacks are very similar throughout the years. They are filled with a mixture of sawdust and the metal scrap 'holes' punched out of Meccano strips. However, the third variation shown above (with red vertical writing) contains far more 'holes' than the other varieties, and this explains their much higher weight (32g compared with around 12g for the other varieties). The wire tie around the neck of the sack is of very fine steel wire in the pre-war variations. The earliest are 0.45mm diameter (26swg), the heavy later ones even finer, 0.30mm (31swg). The opened example above to the left has this very fine wire around the neck. Post-war samples such as the one above right tend to have thicker softer wire, approximately 0.60mm diameter (23swg). As shown in the table below, the final version of the sack is also found with brass wire (see right) – these are direct from an unopened box so are genuine parts. Alan Keith has raised a question about the size of the 'loop' on the end of the wire. It seems that in most of the pre-war parts the loop is made in the wire first (by twisting), and then this resulting loop is wrapped around the top of the bag, with the final loop being twisted presumably by hand. 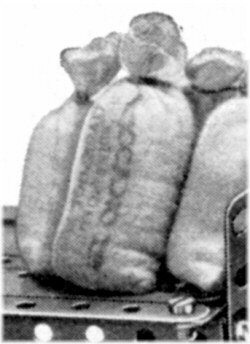 In the post-war bags, one end of the wire is passed through the neck of the bag, then the rest of the wire is wound round the top and twisted together. In both cases, the size of the final loop is somewhat variable – there is no evidence of some kind of standard size such as to fit on an axle. In most models the sacks are shown on a hook. John Nuttall has sharp eyes, and reminds us that the 1954-63 manuals for outfit 3 (or outfit 2a) have loaded sacks on models 3.11 and 3.12. You can see from the scan on the right that these loaded sacks are clearly printed vertically with the words Meccano Ltd, Binns Road, Liverpool. No examples of loaded sacks have been found with this printing yet. DMS/EMP mention very early small Loaded Sacks (but doesn't clearly describe 'small', and so may be referring to the second type shown above). Although there is a reference to 'large' and 'small' sacks in the part numbers below, we must be aware that there is a great variation in the sizes of each type. John Nuttall has carefully found a range of sizes of the two post-war sacks, and the largest 'small' later sack is much larger than the smallest 'large' earlier version. Although the last variation of the loaded sack is generally smaller than previous ones, size is not the main difference between them. The box to the right shows six post-war Loaded Sacks. The part number 12426 identifies this box as being from after 1954, but it could certainly be later. I've never seen loaded sacks in late 60s or 1970s packaging, but someone out there might have some... send me a picture if you have! I have a unopened box of post war loaded sacks as described above part no 122 , 12426. It was a inheritance item , happy to send u a picture, but what do u think this item maybe worth possibly? Just as a guide . I have 12 sacks according to .xx4, overall length between 4.5 and 5.5cm; weight between 15 and 26g. I have something somewhat similar Stuart, but the sack is only 54mm long and 32 mm wide. However it does have the metal loop, albeit somewhat rusty.